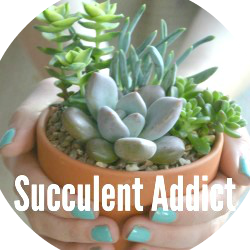 I like to think I use Succulent of the Month to talk about less well known succulents. 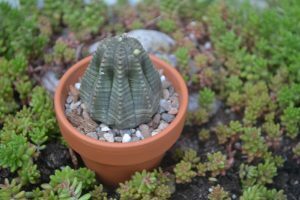 This month’s succulent is one that I have wanted to discuss for a long time and makes a firm favourite in my collection. 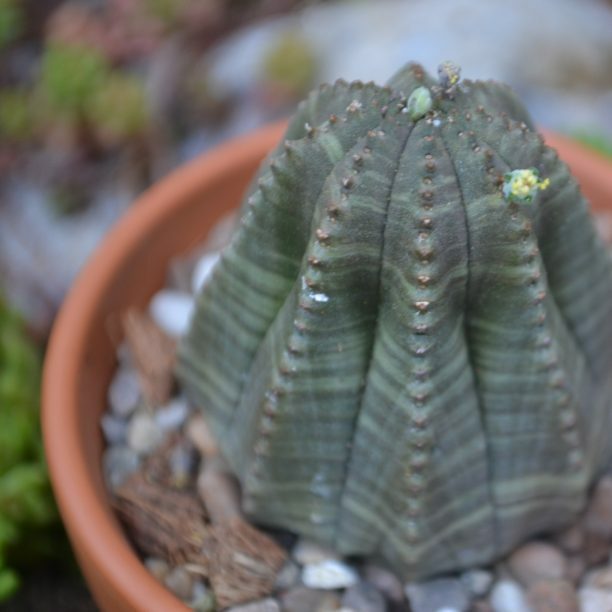 When I came upon Euphobia obesa two years ago, I knew I wanted to buy it straight away. It was weird, wonderful and mysterious and I was curious to see what it did. Truth be told it hasn’t done much except get a bit bigger and a bit more cylindrical. Sometimes it half-heartedly produces a few flowers – but despite its apparent lack of enthusiasm I still love this plant. Fun fact number one: This plant comes from a very specific region of South Africa. 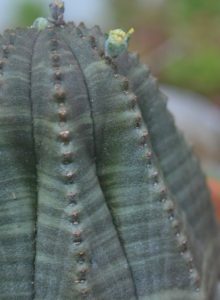 Euphorbia obesa became extremely popular in the years following its discovery, and were collected so widely that they are now almost extinct in the wild. In fact it is likely there are more specimens in cultivation that there are in the wild. Luckily they are easily propogated from seed so while they may be endangered in the wild, we still get to enjoy them in our homes. Fun fact number two: This plant is dioecious, which means it is either has male flowers or female flowers. I think mine might be a lady based on the flowers, but honestly I am not 100%. It needs to produce some more so I can give a more prolonged inspection. Fun fact number three: These plants stay perfectly spherical when young and then become elongated as they get older (the males becoming more cylindrical than the females funnily enough). Distinctive features: Slightly bloated appearance, reminiscent of a baseball when young, lack of stems and attractive ‘gingham’ like markings. Small yellow flowers appear along the margins from the top of the plant. Why I love it: They are adorable when they are young – small and perfectly round like a golf ball. However I was mostly entranced by the beautiful ‘gingham’ like markings. I had never seen a plant quite like this one before. Things to watch out for: I haven’t had any real problems so far – just make sure not to overwater it. Try and give it direct sunlight and protection from frost, but bear in mind it might loose its green-grey colour in full sun after a while. I have also noticed that mine developed a quite pinched look as evident in the photos here. I wondered if it was part of the plant’s normal growth habit as it became more cylindral. It has since rounded again. Not entirely sure what the problem was – could be the natural growing habit or perhaps I just hadn’t watered it enough!